Mansfield based housebuilder Rippon Homes has strengthened its team with the promotion of Neil Vickers to Contracts Manager from Site Manager, after working his way up the company since the age of 16. 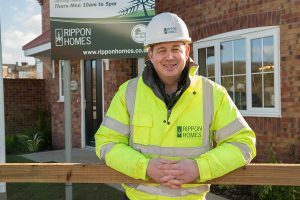 The 42 year old from Sutton-in-Ashfield, who is based at Rippon’s head office in Ransom Wood, Mansfield, now oversees all construction sites, ensuring they are running to programme with the responsibility of health and safety, training of staff and the setting up of new developments. Previously, Neil was Site Manager, in charge of the day to day running of various sites, most recent in the popular village of Welton. Starting in 1991, Neil joined Rippon Homes as an apprentice bricklayer based in Mansfield. The father of two said: “I like the challenges that my new role includes. I now oversee all sites rather than just one, increasing my responsibility. Ian Dyke, Managing Director at Rippon Homes said: “Neil has settled naturally into his new position, following up from his previous role.